For most in the American fire service, pressure-regulating devices and specifically pressure-reducing valves (PRVs) were virtually unknown prior to 1991. It was only after the tragic One Meridian Plaza high-rise fire, which occurred in Philadelphia, Pennsylvania, on February 23, 1991, that PRVs became an essential part of the high-rise standpipe operations training curriculum in the American fire service. After One Meridian Plaza, a great deal of attention was paid to PRVs, and many in the fire service started to recognize these devices as a potentially serious problem. A National Fire Protection Association (NFPA) Alert Bulletin (91-3), “Pressure-Regulating Devices in Standpipe Systems,” published in May 1991, highlighted the dangers posed to firefighters by improperly set PRVs, and it was a much-needed wake-up call. In addition, an excellent article written by Captain Dave Fornell (author of the Fire Stream Management Handbook, Fire Engineering, 1991) published in the August 1991 issue of Fire Engineering served as an excellent start toward educating the fire service. This is an example of an orifice plate mounted inside a 21⁄2-inch standpipe hose valve connection. 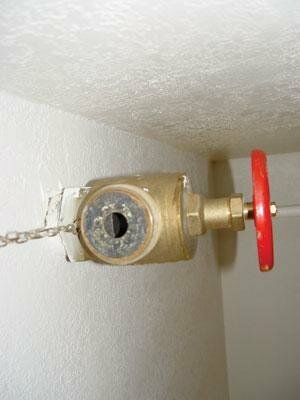 An example of a mechanical PRD in place on a 11⁄2-inch hose valve outlet inside a downtown Denver high-rise building. It’s been nearly 14 years since Philadelphia firefighters were confronted with improperly set PRVs at One Meridian Plaza. Yet, many fire departments, apparently having not been directly affected by that tragedy, have not taken proactive steps to effectively deal with PRVs during standpipe operations. In this article, I revisit the PRV issue and attempt to provide the necessary information for those interested in and dedicated to effecting change across the American fire service. The fire at One Meridian Plaza was a very significant event in American fire service history. It will forever remain as one of the most important high-rise fire case studies, and the lessons learned from this event will carry on for years. It was the 38-story Meridian Bank Building in Center City, Philadelphia. A fire started on the 22nd floor at about 8:40 p.m. and burned for the next 19 hours. The fire consumed eight full floors of the building and required the services of more than 300 Philadelphia firefighters. Three Philadelphia firefighters lost their lives fighting this overwhelming fire. These types of mechanical PRDs are found mostly on older installations. Numerous factors contributed to the loss of the three members of Philadelphia Fire Department (PFD) Engine Co. 11, not the least of which was improperly set PRVs. The post-fire investigation revealed that when the PRVs were originally installed, the pressure settings were improperly adjusted. On the night of the fire, the PRVs reduced the discharge pressure to less than 60 psi, which was not sufficient enough to overcome the friction loss in the 13⁄4-inch hose or to provide the proper operating nozzle pressure for the automatic combination fog nozzles used by the PFD. This low pressure made it impossible to develop effective fire streams; thus, firefighters were unable to combat this large, fast-moving fire. This type of mechanical PRD is considered field and fireground adjustable-removable. However, when it is encountered, it is best to simply remove the device entirely and attach hose directly to the hose valve. A threaded adapter may be required. The PRVs in One Meridian Plaza were in fact field adjustable; however, it wasn’t until several hours into the incident that a technician equipped with the proper tools and an understanding of the adjustment process was able to effectively adjust several of the PRVs. By that time, the fire had gained considerable headway and had control over several floors, making manual firefighting impossible. Ultimately, the improperly set PRVs made it impossible for Philadelphia firefighters to combat this fire when it was still a manageable size. In most cities, standpipe systems, especially those in tall high-rise buildings, are typically equipped with pressure-regulating devices. These devices can generally be found in two locations: at zone/floor-control valves for combination standpipe/sprinkler systems and at standpipe hose-valve outlets. This type of PRD limits how far the valve can be opened. It is easily removed with a small Allen wrench, or it can be broken off, making it fireground adjustable-removable. In larger systems, specifically those in tall high-rise buildings, the head pressure on the lower levels of a standpipe riser can be significant. Add to that the pressure from the building’s fire pump, and excessive pressures can be encountered at many locations, but especially at the lower levels. Because of this, there may be a need to reduce and regulate the pressure at standpipe hose connections. Most fire code requirements for standpipe systems are based on recommendations from National Fire Protection Association (NFPA) 14, Standard for the Installation of Standpipe and Hose Systems, and NFPA 13, Standard for the Installation of Sprinkler Systems, respectively. These requirements include the installation of an approved pressure-regulating device any time the static pressure within a standpipe system will exceed 175 psi. When the static pressure at a hose connection exceeds 175 psi, an approved pressure-regulating device shall be provided to limit both static and residual pressures. Furthermore, if flowing pressures exceed 100 psi, then NFPA 14 requires that “an approved device” be installed at the outlet to reduce pressures to a maximum of 100 psi. This type of limiting PRD uses a round-shaped device to keep the valve from being fully opened. It isn’t designed to be broken off, but it can easily be removed by using an Allen wrench to loosen two setscrews. Pressure-restricting devices (PRDs), sometimes referred to as pressure-restricting valves, reduce pressures in flowing conditions only. These devices/valves operate in a manner similar to a fire department pump operator’s gating down at the pump panel of a pumper. They do not compensate for changes in input pressure to maintain a constant discharge pressure, and they do not control pressure in static conditions. For these reasons, their use is limited. There are several different types of pressure-restricting devices/valves. Orifice plate. An orifice plate is a metal disk with a restricting orifice. Orifice plates may be inserted into outlet connections to standpipe systems to reduce residual pressure on the downstream side. Although relatively inexpensive, orifice plates are generally undesirable because they do not maintain a steady discharge pressure and because they can damage hoses, specifically the inner lining, if the pressure jet from an orifice plate strikes the inner wall of a hose. If used, orifice plates should always be installed at hose couplings to allow for easy removal. This type of limiting PRD is very firefighter-friendly. Notice the sign with clear instructions on removal to increase pressure. An orifice plate basically looks like a very large metal washer. With the orifice plate installed at the standpipe outlet, there is very good access to the device. Removal of the orifice plate can usually be accomplished by prying it off with a small screwdriver. Simply insert the screwdriver between the hose valve outlet wall and the outside of the orifice plate; with a little leverage, pry the orifice plate off and out. You can also use a pair of channel locks: clamp down on the middle of the orifice plate and pull it out. The orifice plate is not field or fireground adjustable. However, it can usually be removed; therefore, it can be considered fireground removable, and firefighters can easily deal with it. To increase pressure, simply grasp the pin and pull it out. The pin holds an adjustment collar in place and restricts the valve from being fully opened until the pin is removed. Mechanical PRD. This mechanical device has hose threads on both ends and resembles different types of fire department appliances. It is similar in size to certain adapters such as a double female. This mechanical pressure restricting device, also referred to as a pressure-reducing device, is a one-piece mechanical device designed to restrict/reduce outlet pressure (photo 2). This device has a series of overlapping holes cut into the waterway, through which the water flows. It is considered to be field adjustable and is fireground adjustable, as the size of the opening can be manually adjusted by turning a knob on the outside of the device to fully open, fully close, or partially open the holes. This device restricts and thus reduces pressure, but only in residual or flow conditions. It does not compensate for excessive static pressures (photo 3). For fire department operations, instead of adjusting the water flow by adjusting the device, it is recommended that the entire device be removed. This device, which is threaded onto the standpipe outlet, is easily removed, making it fireground removable, and thus allows an engine company to then attach its hoseline directly to the standpipe outlet, threads permitting. These types of PRDs are found mostly in older buildings; it would be rare to find them installed in newer standpipe installations. In fact, Elkhart Brass, one manufacturer that has produced these types of PRDs in the past, has discontinued production and sale of this type of device (photo 4). Limiting PRD. A mechanical limiting device works by limiting the valve from being fully opened. This type of PRD is mounted on the valve handle itself. This limiting device, or stop, works to physically limit the distance the valve can be opened. Firefighters can easily deal with most PRDs of this type, as they are typically designed to allow for complete removal or can be broken off without damaging the valve itself. Once the limiting device has been removed, the valve can then be operated normally and opened fully if necessary (photo 5). There is also another type of pressure-restricting device/valve that has a mechanical limiting device and works in the same manner as the previously described PRD. Once again, this type of device is mounted on the valve handle itself. This is not designed to be broken off; however, this type can be removed by loosening two setscrews with an Allen wrench. Once it’s free, the restricting device can be completely removed from the valve handle. 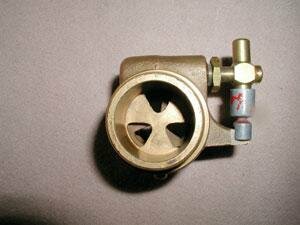 With the restricting device removed, the valve can then be fully opened (photos 6-8). One more variation of a limiting PRD involves the use of a removable clip that holds a collar in position and is located on the outside of the valve stem. Once again, this device acts to limit the valve from being fully opened. This device is field and fireground adjustable/removable without any special tools. Simply remove the pin from around the collar by pulling outward; once removed, the valve can be opened fully (photos 9, 10). The preferred devices for regulating excessive pressures are pressure control and pressure-reducing valves (PRVs). These valves are designed to actively regulate outlet pressures in both static and flowing conditions, and, based on NFPA 14 recommendations, most fire codes require them for outlets of systems where static pressure could exceed 175 psi. 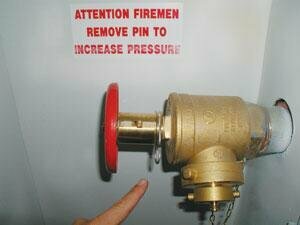 Pressure-control and pressure-reducing valves are preferred over pressure-restricting valves/devices because hoses and sprinkler systems connected to standpipes are exposed to both static and flowing conditions and uncontrolled static pressures can cause equipment failure and pose a danger to firefighters. An increase in inlet pressure does not increase outlet pressure by the same amount on most PRVs. Some PRVs allow only a percentage of an increase; others have maximum outlet pressure. Pilot-operated PRVs are set for maximum outlet pressure; therefore, fire departments cannot pump additional pressure to an outlet. These types are normally found in line to low zone or to separate riser manifold. A hose valve connection at the lobby level of a Denver high-rise. Both valves are supplied by the same riser. The upper valve is a PRV with a check valve; the lower valve is a standard hose valve without a check valve. The standpipe could be supplied by the lower valve but not the upper one. 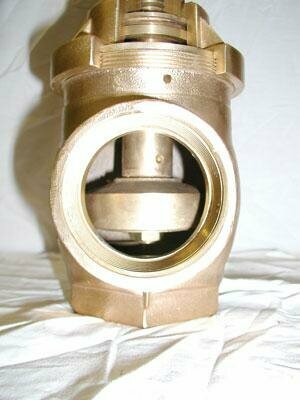 Most PRVs also act as check valves; the direction of flow is marked with an arrow on the valve body. This is particularly important, as it eliminates the possibility of pumping into a lower-floor outlet. In situations where the outside fire department connection is damaged or not accessible-and when fire departments want to establish and maintain a secondary, redundant water supply for a standpipe system-an outlet, typically on the first floor, can be pumped into. However, if this outlet is equipped with a PRV, it will also act as a check valve and will not allow water to be back-fed into the riser. In one building in downtown Denver, a standpipe hose valve located at the lobby level is equipped with two separate valves. One valve is a factory preset PRV, and the other is a standard hose valve. A fire department engineer/pump operator could not pump water into the system by way of the PRV valve but could pump into it using the standard hose valve (photo 11). A Powhatan factory-preset PRV. The ring at the top of the valve body provides a very subtle indication that this is a PRV. Pressure-control and pressure-reducing valves employ a mechanism that compensates for variations in inlet pressures by balancing water pressure in an internal chamber or chambers, typically against a spring. A pressure-control valve, a type of pressure-reducing valve that is pilot operated, is considered by many to be the most reliable method of controlling pressure. Often, the outlet pressure is not field adjustable and valves are preset at the factory for use at a specific floor level in a building. In such cases, it is critical to ensure that valves are installed at the intended location. A cut-away view of an Elkhart factory preset PRV. Note the ring at the top of the valve body and the two separate internal water chambers. The entire issue of standpipe system PRVs has been interesting and controversial for a number of years. My own experience has been very frustrating: Every time I begin to think that I have found the answers to the myriad of problems and issues surrounding PRVs, I actually come up with more questions. To further complicate matters, when seeking out resources and conducting research to answer the many questions, you quickly realize that there is a wide range of different answers to the same questions and that, obviously, they can’t all be correct. The terminology associated with PRVs is a very good example. The definitions of certain types of PRVs and PRDs provided by nationally recognized standards, such as NFPA 14, are sometimes different from those provided by the manufacturers of various valves. I am much more interested in simplifying the problems associated with our operations than getting caught up in semantics. Note how small the waterway opening is on a Powhatan factory-preset PRV. This opening measures about 3⁄8 inch. This will still provide adequate volume but at a low pressure. In an attempt to simplify what can be a very complicated subject, I prefer to break the whole PRV issue down into a couple of very basic, commonsense categories. The first is whether the type of pressure-regulating device is a valve or a device. It can be defined as a valve when there are internal components associated with its pressure regulation that cannot be removed. It can be defined as a device when there are either external components, such as limiting devices, or internal components, such as an orifice plate, associated with its pressure regulation. These components are separate from the actual valve and can be removed, ultimately changing the valve from a PRD to a standard hose valve on removal. This printed sign on a standpipe cabinet in a downtown Denver high-rise clearly indicates the presence of a PRV and the location of tools to adjust valve pressure. These tools are kept in the Fire Command Center and the fire pump room and can be used to adjust the pressure on the Zurn brand PRV. Factory preset, not adjustable. Just as the name implies, these types of valves have been preset at the factory during the manufacturing process. Most important to us, they cannot be adjusted and the pressure cannot be changed anytime during fireground operations-simply put, what you see is what you get. This is not necessarily a bad thing if the valve has been properly designed, assembled, installed, and maintained. However, there is plenty of room for human error associated with these types of valves. Removing the bonnet of a Zurn PRV using a large adjustable wrench. To begin with, a fire protection engineer designs the system and makes recommendations for the installation of PRVs based on his mathematical calculations. His math must be 100-percent accurate and based on accurate data provided by the building architect with regard to the specific characteristics of that building such as size, area, and the like. If not, it could affect one or several components within the entire fire protection system. Second, even if all of the fire protection engineer’s calculations are correct, the valve must still be assembled properly for the factory-preset type or adjusted properly for the field-adjustable type. Once again, there’s plenty of room for human error. A factory-preset valve assembled based on proper and accurate mathematical calculations can easily lead to a future fireground problem if it is not installed in the intended location. In many high-rise buildings, hundreds of PRVs could be installed and used throughout the building. Every one of them must be designed properly, assembled properly, installed properly, installed at the designed location, flow tested, and properly maintained to ensure safe and proper operation when needed. That’s a very tall order. Removal of the bonnet provides access to the adjustment nut. Two examples of factory-preset PRVs are the Elkhart and Powhatan models. These devices have a similar appearance and the signs indicating that they are PRVs are rather subtle compared with some of the other larger PRVs. On both these models, there is the appearance of a large ring extending outward around the valve body near the top. Inside, these factory preset valves have a set of water chambers that work by internal hydraulic controls to regulate and reduce pressure under both flowing and static conditions. Once again, it is important to note that both of these types of PRVs are factory preset and are NOT field or fireground adjustable (photos 12-14). Using a deep 3⁄8-inch socket, the Zurn PRV can be adjusted. A clockwise rotation of the adjustment nut will increase pressure; a counterclockwise rotation will decrease pressure. Field adjustable. Several years ago, I was assigned as the captain of DFD Engine Co. 3. 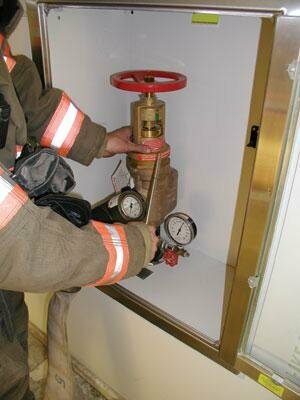 We had recently operated at a high-rise fire in which the building had built-in automatic pressure-reducing valves. We operated with a 21⁄2-inch handline. The PRV operated properly, the fire was quickly controlled, and the operation was brought to a safe and successful conclusion. However, during our post-fire review, we realized that most of us didn’t have a comprehensive understanding of the particular type of PRVs in this building; more importantly, we did not know how to deal with them during emergency conditions in the event of a malfunction. A Giacomini PRV. Its large size is the first indication that it is a PRV. After this incident, I immediately contacted a friend, who at the time was assigned to our Fire Prevention Bureau. Captain Thor Hansen was plenty sharp and was a tremendous resource with regard to fire prevention and code enforcement issues. A few shifts after that high-rise fire, we met with him at a building that had the same type of PRVs. He introduced my crew and me to the building engineer, who proceeded to educate us about this particular PRV. Labels on the Giacomini valve give instructions for making pressure adjustments. This is the second, clear indication that this is a PRV. The PRV in question was a Zurn valve. In this particular building, there were printed signs at the standpipe hose valve locations indicating that tools to adjust valve pressure were located in the Fire Command Center (FCC) and the fire pump room. This information would immediately give the unsuspecting firefighter his first clue that there was a PRV at this standpipe hose valve (photos 15, 16). The building engineer showed us how we could use the large adjustable wrench to loosen and remove the bonnet portion of the valve. Once the bonnet was removed, we could use a separate tool, a wrench with a very deep 3⁄8-inch socket on a ratchet, to adjust the valve pressure (photos 17-19). The adjustment can be done by turning an adjustment nut clockwise to increase pressure and counterclockwise to decrease pressure. My crew and I were very excited with this new information. We felt as though we now had a significant advantage and could potentially solve low-pressure problems associated with these types of PRVs at any future high-rise fires in buildings equipped with these types of PRVs. We also discovered that the term “field adjustable” can be somewhat misleading. This type of valve falls into the category of field adjustable. However, the term primarily applies to field adjustment during the installation process-in other words, a fire protection engineer, based on his calculations, could have his crew members make the necessary adjustments to these types of valves after installation at a particular building. For example, let’s say a 50-story high-rise building is being built. A two-zone standpipe system (high zone and low zone) was designed and installed in the building, using numerous PRVs, a total of 80, at specific locations. The manufacturer will design and build 80 identical valves and send them to the construction site. These valves will then be installed and field adjusted at the time of installation based on their respective vertical location within the standpipe system. Although this type of valve is field adjustable, it could be a rather cumbersome process to make adjustments during fireground operations. First, the tools needed to complete the adjustment must be located and brought to the site where a valve needs to be adjusted. That location could be several floors away from where the tools are located, which is generally a fire pump room located at one or more mechanical levels or the FCC in the lobby. With this particular valve, the size and weight of the tools needed to make pressure adjustments make them impractical to carry in a fire department’s high-rise standpipe equipment tool bag. To simplify, the term “field adjustable” does not necessarily mean that it can be adjusted quickly, specifically in the heat of battle during fireground operations. Although this particular type of valve, the Zurn Valve, can be considered fireground adjustable, that is so only if firefighters receive comprehensive prefire training and if tools to make the adjustments can be quickly and easily accessed when needed. Fireground adjustable. Because the term “field adjustable” can be a bit misleading, I felt it necessary to provide a couple of additional terms that can be applied to our operations. What is of critical importance to the fire service is whether or not a pressure-reducing or -regulating valve can be adjusted with speed during a high-rise building fire-in other words, is the PRV or PRD truly fireground adjustable? Keep in mind that a particular valve can be both field adjustable and fireground adjustable. Fireground removable. One additional term that should be included is ”fireground removable.” Many of the PRDs previously addressed would fall into this category. If firefighters can quickly remove a restricting device and thus allow full pressure to be delivered from the hose valve outlet, that device is in essence fireground adjustable by removing the device. The adjustment occurred when the device was removed. In the process of solving fireground problems, many of the answers can come long before the fire, during prefire planning. Identifying that a particular building has pressure-regulating devices is the first step toward solving a potentially devastating fireground problem. Determining whether the particular valve or device can be adjusted or removed during a fire (is it fireground adjustable or removable?) would be the next step. Last but not least is the critical step of providing firefighters with the necessary tools and training for making the adjustments. The PRVs at the One Meridian Plaza fire were of the field/fireground adjustable type. Unfortunately, missing from the equation were the tools necessary to adjust the valves and prior training for the firefighters on how to complete such an adjustment. While preplanning many high-rise buildings in my first-due response area, I have found a significant number of PRVs of the same type as those in One Meridian Plaza. Because of that fire, these types of PRVs had an ominous reputation within the American fire service. However, I have found, on taking a much closer look, that these types of PRVs are user friendly with regard to fireground adjustment. 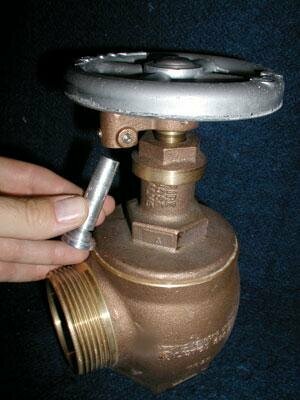 The type of valve to which I am referring is a Giacomini. It is manufactured in Italy. Immediately upon seeing the valve, it is very obvious that it is a PRV type of valve. First, it is a very large valve, much larger than a standard standpipe hose valve. Second, it has several different labels affixed to the valve body, providing instructions on how to adjust the valve pressure (photos 20, 21). The method used to adjust the outlet pressure on this type of PRV is very clear and requires minimal training. Furthermore, there is only one tool needed to adjust this type of valve-a very small, compact, and short metal rod about 3⁄8-inch in diameter and about 14 inches long. This small red box, located in the Fire Command Center of a Denver high-rise, contains several adjustment rods that can be used to make pressure adjustments to the Giacomini PRV. The tools (valve adjustment rods) are typically kept in one of two locations. At one building in my district, there is small red cabinet in the FCC with a label that reads “Valve Adjustment Rods.” A bundle of about 20 adjustment rods are stored inside. 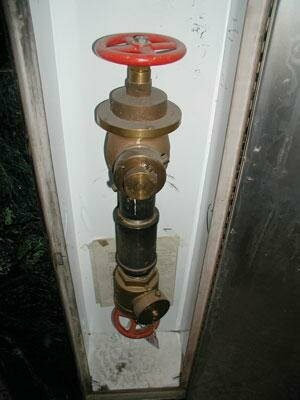 In another building, valve adjustment rods are located inside the standpipe cabinet at the hose valve (photos 22, 23). A Giacomini PRV with the valve adjustment rod inserted into a hole on the rotating barrel. Fire departments should not count on finding these tools inside the building when they need them. Valve adjustment rods in the FCC or fire pump room may be several floors away from where they are immediately needed, and those located inside standpipe cabinets will eventually come up missing. Any number of things can happen to the tools between the time they are installed and the night of our fire. Ultimately, we must be prepared. A firefighter prepares to insert the valve adjustment rod into a hole in the rotating barrel near the top of the Giacomini PRV. The captain of one of the engine companies in my district, Captain Dave Borelli of Engine Co. 24, suggested that we make our own tools and carry them inside our standpipe kits. He contacted our repair shop and requested that it fabricate several of these adjustment rods for the companies. We have added one adjustment rod to every engine company’s standpipe kit. Because of the rod’s small size and minimal weight, the addition to the equipment kit presents no problems. This was a very good, proactive step to ensure that we have tools available inside the building at the standpipe outlet if pressure needs to be adjusted on this type of valve. Note the hole in the rotating barrel. There are four holes on this barrel, one in each quadrant. The Giacomini PRV has four holes bored into a rotating barrel near the top of the valve. To adjust the pressure, a valve adjustment rod is inserted into the most accessible hole, and the barrel is rotated. In tight quarters, such as inside a standpipe hose valve cabinet, the size of the valve adjustment rod will not allow for continuous rotation of the barrel. The rod will have to be removed and placed in the next hole to continue rotating the barrel. This process will continue until the pressure adjustment has been completed. Like the Zurn valve, pressure can be increased on the Giacomini valve by rotating clockwise, whereas a counterclockwise rotation will decrease the pressure (photos 24-26). The firefighter can adjust valve pressure when the valve is open and with water flowing by rotating the barrel clockwise. Ever since the One Meridian Plaza fire, several members of the Denver Fire Department have been actively looking for and identifying the presence of pressure-regulating devices in buildings throughout our city. It has been determined that numerous buildings of various sizes and occupancies in our city do in fact have pressure-regulating devices. They have been found in a wide variety of buildings from large public high schools to the newest commercial and residential high-rise buildings. Firefighters have even identified the presence of PRVs inside a five-story assisted-living center. Prefire planning by firefighters and companies has determined that there are currently at least eight variations of pressure-regulating devices used in high-rise and standpipe-equipped buildings within the city and county. Looking inside the valve, a threaded stem (left) indicates a standard hose valve. A smooth stem (right) indicates a PRV. Ultimately, the primary concern associated with pressure-regulating devices has to do with discharge pressure during fireground operations. Research and flow testing have determined that most PRVs in the city and county of Denver are set to provide a discharge pressure of from 70 to 90 psi. That means very little pressure to overcome friction loss and nozzle pressure. The use of low-pressure, high-volume weapons for firefighting operations is critical. There are some specific indications that a pressure-regulating device is present. On pressure-restricting devices, the restricting device is typically located on the outside stem of the valve, making it easy to identify and in most cases easy to adjust or remove; these types of valves, therefore, are fireground adjustable/removable. This factory-preset PRV is located at the ceiling level and is reducing pressure before water is delivered to a hose valve and the sprinkler system. Not seeing a PRV at the hose valve is not an assurance that one doesn’t exist. Pressure-regulating valves, such as the Zurn and Giacomini, are very large valves, which is a good initial indication of the presence of a PRV. Also, the Giacomini has written labels with instructions on how to adjust the pressure. All of this clearly indicates the presence of a PRV. The factory preset models, such as the Elkhart and Powhatan, are closer to the size of a standard hose valve and have very subtle differences, making them difficult to identify as PRVs. However, on both of these valves, the valve body is larger at the top, near the valve stem, which indicates the presence of the internal water chambers and thus the presence of a PRV. If all else fails, a dependable method you can use to determine the presence of a PRV is to simply remove the cap from the outlet and look inside. A smooth operating stem is typically an indication of a pressure-reducing valve. A threaded operating stem is typically an indication of a standard hose valve, but remember that restricting devices could be on the outside (photo 27). It is important to note that even if there is no pressure-regulating device at the standpipe hose valve, PRVs could still be used in the system. Buildings that have a combined standpipe/sprinkler system using the same riser to supply both the floor hose valves and the sprinkler system frequently are equipped with PRVs. In these combined systems, the PRVs are often hidden and are sometimes located in the plenum space above a drop ceiling tile. In these situations, fire companies could have a low-pressure problem at the hose valve caused by an improperly set PRV hidden from view (photo 28). The city and county of Denver can be used as an example of the many cities and jurisdictions across the fire service that are responsible for the fire protection of countless high-rise and other standpipe-equipped buildings. In Denver, more than 350 buildings are classified as high-rises (75 feet or greater in height) and of those, more than half are not fully protected by a sprinkler system. Hundreds more low-rise and large-area buildings in Denver are equipped with standpipe systems. Within all these buildings, there are thousands of pressure-regulating devices. There is simply no way to tell what the actual discharge pressure and flow of a specific valve is without actually flow testing the valve. This is why it is essential that your city adopt NFPA 25, Standard for the Inspection, Testing, and Maintenance of Water-Based Fire Protection Systems. NFPA 25 requires the periodic testing of PRVs, which will uncover pressure problems, especially those valves that are improperly set. Firefighters must still operate within a strong mindset and prepare for the failure of or anticipate that a PRV might be improperly set. We can’t control the myriad of issues associated with PRVs and their performance, but we can select the best weapons to use for operations in buildings equipped with standpipes, specifically standpipe pressure-regulating devices. The current edition of NFPA 14 recommends, as previous editions also have recommended, that fire departments use 21⁄2-inch hose with a 11⁄8-inch smooth bore nozzle for standpipe operations. Fire departments equipped with only 13⁄4-inch hose and combination nozzles, specifically the automatic type, need to take proactive steps and change their operational policy with regard to equipment used for standpipe operations. If for no other reason, this must be done for firefighter safety and survival. All fire departments that respond to and operate at high-rise and standpipe-equipped buildings should be equipped with 21⁄2-inch hand-lines and smooth bore nozzles. This complement of weapons is critically important for operations in buildings that use pressure-regulating devices, especially pressure-regulating valves that are non-fireground adjustable. Furthermore, fire departments must keep in mind that this is not just a low-pressure issue. High-rise buildings, especially those that are commercial occupancies, require a very proactive and aggressive approach to weapons selection from the outset. Our window of opportunity to stop a serious fire in a commercial high-rise building is very narrow. These are not “bread and butter operations,” and the 13⁄4-inch preconnect with tank water is not an option. The reflex time at these fires is significant. Recent training conducted by DFD District #3 indicated that even with firefighters who were very well prepared and extremely strong physically and mentally, water delivery to a fire on the upper floors of a high-rise building could take 20 or more minutes from the time of arrival. Because that fire can easily double in size every 30 seconds and because of the tremendous potential for rapid fire growth and spread within the large uncompartmentalized areas typical of a commercial high-rise building, proactively selecting and using a 21⁄2-inch attack line from the beginning provides the greatest margin for success and firefighter safety. This complement of weapons should always be carried into the high-rise building, especially the commercial high-rise. This should be the standard procedure even for automatic-alarm investigations, as we usually tend to fall back on our daily habits, especially when the heat is on. Statements like “The 21⁄2-inch is too big,” “too hard to maneuver,” “takes too much time,” “we don’t have enough staffing,” and, the most pathetic two words that can be spoken, “we can’t,” must be eliminated from the fire service vocabulary. A strong commitment to mental and physical preparedness, along with a consistent and regular diet of training on the use of this most valuable tool, is what differentiates the exceptional engine company from those companies that simply get by and sometimes don’t get the job done at all. To which company do you want to belong? Jeffrey M. Shapiro, Chapter 18, “Standpipe and Hose Systems,” Fire Protection Handbook, Nineteenth Edition, Volume II, National Fire Protection Association (NFPA), 2003. United States Fire Administration (USFA) Technical Report Series, “High-Rise Office Building Fire, One Meridian Plaza, Philadelphia, Pennsylvania.” Report by: J. Gordon Routley, Charles Jennings, and Mark Chubb, 1991. “Pressure Reducing Valves” presented by Rick Matsuda, P.E., City of Callas Building Inspection, Dec. 4, 2003.